Colleges in North and South Carolina are starting to resume operations that were shut down by Hurricane Florence. East Carolina University said it would resume operations on Wednesday. 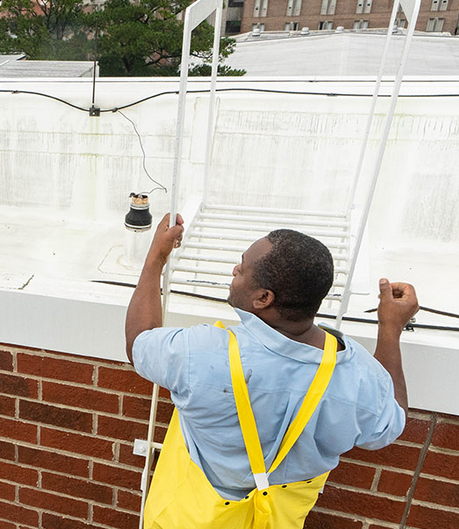 Buildings management staff are currently working to get water off of rooftops (at right) and to deal with flooded areas of the campus (above). At places like East Carolina, officials said that the threat now is from flooding on campus and of routes used by students and employees to reach the campus. Other campuses announcing plans to re-open include Barton College (opening Wednesday), Charleston Southern University (opening Tuesday), Claflin University (business operations today and classes Tuesday), College of Charleston (opening Tuesday), Elizabeth City State University (campus opening today and classes starting up Tuesday), Fayetteville State University (hoping to open Wednesday), Trident Technical College (resuming classes today) and University of South Carolina (open today). Many students from College of Charleston were briefly housed at South Carolina when their campus was evacuated. The University of Mount Olive announced on social media that campus damage has been more minimal than expected, but that there is no power on campus. For some campuses that were in the area more severely hit by Florence, no dates or more distant dates have been set for reopening classes. Craven Community College, which has a campus in New Bern, N.C., an area experiencing extreme flooding, announced that it will be closed this entire week. The University of North Carolina at Wilmington, in an area with extensive flooding, announced that it has been unable to assess campus damage, and pledged to give ample notice before resuming operations. The university has also created a relief fund for students in need. Many colleges in the region have also been reaching out to parents. 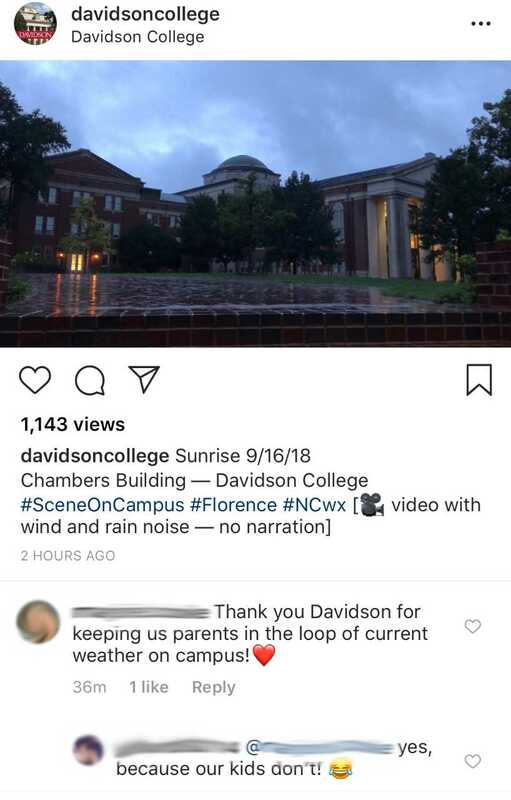 As attached comments from the Davidson College Instagram account show, some parents have been appreciative as they can't necessarily count on timely information from other sources. Below are some more photographs posted to Facebook by East Carolina University. Inside Higher Ed wishes the best to all colleges hit by the hurricane and associated flooding, and invites campus officials to post updates in the comments on this article.